Michael Hofmann and Linda Green's home on Puuhonua Street in Manoa was flooded by mud due to the recent heavy rains. Workers helped shovel the mud into buckets and formed a human chain to carry it all out. Thundershowers slammed Oahu again last night, flooding rain-soaked communities, causing Makiki Stream to overflow its banks and spill into several homes, and spurring at least two mudslides. In McCully, Makiki Stream overflowed near Fern Street at about 8 p.m., sending water into homes, Fire Battalion Chief Peter Gaskell said. Firefighters were helping homeowners pump out water from the flooded apartments last night, he said. Landslides were reported in Manoa and on Round Top Drive. The latter closed the roadway between the 2400 and 2900 blocks, police said. The mudslide is the fourth in as many days in the area. Officials said it was about four times bigger than the previous slides. In Manoa a mudslide spilled onto the roadway at the 3300 block of Paty Drive in Beaumont Woods, city spokesman Mark Matsunaga said. No injuries in either landslide were immediately reported. It was not immediately clear if any homes were affected. At the height of the heavy rains last night -- between 7:30 and 8:30 p.m. -- firefighters responded to 13 calls to help pump rainwater from flooded homes or streets, Fire Department spokesman Capt. Jerry Spencer said. Police also monitored several reports of ponding on roadways in Waikiki and downtown Honolulu. And in Punahou, rushing runoff in storm drains blew off a manhole cover, creating a hazard for drivers. Also, lightning might have caused a utility pole fire at 909 University Ave., Hawaiian Electric Co. spokesman Jose Dizon said. The fire blew a transformer, leaving more than 1,700 customers in Manoa without power, Dizon said. 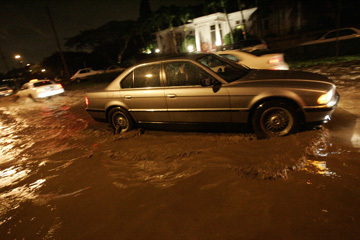 Yesterday's brief period of sunshine was succeeded by heavy rain by the evening, causing flash floods and potentially dangerous conditions for motorists in areas like this intersection between University Avenue and Manoa Road. The National Weather Service issued a severe thunderstorm watch last night for Oahu, the Big Island and Maui. The thundershowers largely dissipated, though, after passing over Oahu. Between 5 and 8 p.m. yesterday, Palolo Fire Station and Aloha Tower got more than an inch of rain. Other parts of the island got nearly half an inch over the same period. A flash flood watch remains in effect for all islands through tonight. The rain is expected to let up today, but will return tomorrow night with a new storm system, forecasters said. "It's a pretty strong disturbance coming through," said weather service hydrologist Kevin Kodama. Much of the state has a good chance of heavy rain through Tuesday night, he said. On Thursday night and early yesterday, thunderstorms spurred a tornado on Lihue and hail on the Big Island. Forecasters say the weather phenomena -- both rarities in the islands -- were thanks to unstable air in the atmosphere. "The air is so unstable, it can trigger these things," Kodama said, adding that hail is usually reported at least once year on average, while tornadoes come every few years. "The conditions are just very favorable for these types of situations." Also late Thursday, heavy rain flooded parts of Waikiki and was to blame for a 42-inch sewer line rupture that sent an unknown amount of untreated waster into the Ala Wai Canal. The break was at Kaiolu Street. The city posted warning signs along the canal and other points downstream. Kaiolu Street and the left lane of Ala Wai Boulevard are expected to remain closed through the weekend for the line repairs. In other weather-related news, U.S. Sen. Daniel Inouye has asked the U.S. Army Corps of Engineers to conduct a flood assessment in Kaaawa and Punaluu to see what can be done to prevent flooding there. Inouye said he has asked the federal government to pick up the tab for the assessment and has secured the first $300,000 for the job. He said the corps is continuing to work with other agencies on flood control planning in Kahuku, including Kahuku High School and Wailele Stream in Laie. So far, about $12 million has already been spent on efforts to control flooding in Kahuku, Inouye said. 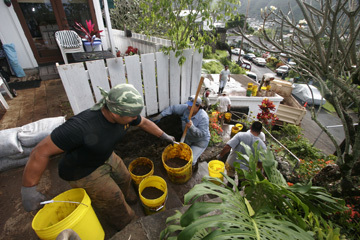 Hawaii National Guardsmen, state land employees and Oahu Community Correctional Center inmates formed an old-fashioned bucket brigade to help a Manoa couple clear their back yard of mud yesterday and Thursday. Heavy rains overnight Tuesday and Wednesday washed mud down from Tantalus and into Michael Hofmann's back yard on Puuhonua Street. "We have a back fence, and we always keep the gate closed. So what happened is it dammed up. And the water was getting through, but all the mud was settling," he said. Two feet of mud settled into the yard and was pushing on the home. The mud also helped channel water into the home. State Civil Defense officials determined the mud was a health and safety threat, and ordered its removal, said Ray Lovell, Civil Defense spokesman. Star-Bulletin reporter Leila Fujimori contributed to this report.